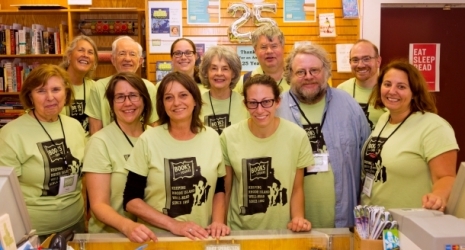 Since 1992, Books on the Square is the independent bookstore in the heart of historic Wayland Square. We have the best children's book selection in the city for more than a decade now, thanks to our buyer Robin Gross. See something special and want us to stock it? Maybe it's something you have created yourself. Give Emily a call to see how we can help. We host many events throughout the year, ranging from author talks and book clubs to game nights and children's parties. Contact our events organizer to see how we can help your gathering succeed. We have been serving the Rhode Island community with classroom and library orders since 1992. Ordering books for your class is quick and easy, and is eligible for a discount. Forward-thinking businesses invest their dollars back into the Rhode Island economy by ordering with us at a competitive price to out-of-state online outlets. If you would like to order books for your organization, contact us by phone or email to get started. Here we are celebrating our 25th anniversary in September 2017. We are Providence's convenient independent bookseller because we've got plenty of free parking directly around the store and along neighboring streets. • Handicap parking available directly in front of store. • Four spots reserved in the lot behind the bookstore on Medway Street. • Free 2 and 3-hour parking along Angell and Medway Streets, Wayland and Elmgrove Avenues. Take exit for 195 E and follow to the Gano Street exit. Take Gano Street exit and turn left at the end of the off ramp. At the next stop sign, turn right onto Gano St. Go through 3 lights and turn right onto Medway Street just beyond the third light. Our back entrance is halfway down the block on the left hand side. You may travel around the block and find additional on-street parking in the front. Take the Gano Street Exit (Exit 3) in Providence, at the bottom of the ramp, turn right onto Gano Street. Continue up the hill to the light at Waterman Street and Turn Right. Drive one block and Turn Left onto Wayland Avenue. Drive 2 blocks and Turn Left onto Angell Street. Books on the Square is located on the left, in the first block, across from Starbucks. For the safety of our customers and staff, we will be closed whenever the city of Providence implements a parking ban, or when common sense says that the weather is too dangerous to travel in. Book clubs and author events will be cancelled and rescheduled to a later date whenever possible. If weather is questionable, please call (401) 331–9097 to make sure we will be open when you arrive.